Homemade Cafe Rio style mild tomatillo sauce is simmered in your electric pressure cooker along with chicken breasts to create the base of your enchiladas. The meal is finished off in the oven when shredded chicken, green sauce and monterey jack cheese are wrapped in flour or corn tortillas and baked. Top each enchilada with avocado slices and a bit of sour cream and you have a party in your mouth. Turn your Instant Pot to the middle saute setting. Warm up the olive oil. Add in the onions and garlic. Saute until translucent, about 5 minutes. In a blender combine the chicken broth, green pepper, jalapeno, tomatillos and cilantro. Blend until smooth. Pour the mixture into the Instant Pot. Add in salt, pepper, cumin and sugar. Stir. Nestle the chicken into the pot. Cover and secure the lid. Make sure valve is set to “sealing.” Set the manual pressure cook button to 10 minutes. Let the pressure release naturally for at least 10 minutes (longer if you have more time). Turn the Instant Pot to the highest saute setting and let the sauce bubble and boil and reduce down to desired consistency. Meanwhile, shred the chicken on the cutting board. Spray a 9×13 baking dish with non stick cooking spray. Use 1/4 cup of green enchilada sauce from the Instant Pot to spread on the bottom of the pan. 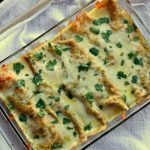 Assemble the enchiladas: evenly divide half of the enchilada sauce, half of the shredded cheese and all of the shredded chicken among the 10 flour tortillas or 12 corn tortillas, roll and place seam side down in the pan. Cover dish with foil and bake at 400 degrees for 20 minutes. Remove the foil and bake for 5 minutes longer. Sprinkle with additional fresh cilantro. Serve with diced avocados and sour cream, if desired. * Tomatillos: a lot of people I’ve talked with don’t know what tomatillos are. They look like a green tomato and are covered with a papery husk. They tend to get a sticky residue on their skin so just rinse them well and rub off the stickiness. Tomatillos have a mild flavor. They are not spicy at all, they almost have a sweetness to them. **If using corn tortillas, preheat oven to 400 degrees. Brush tortillas lightly with vegetable oil, spread on a baking sheet and heat in oven for about 5 minutes, just until soft and pliable. You can easily double this recipe and make an extra pan of enchiladas if you’re serving a crowd.